Native American Chef Loretta Barrett Oden (Citizen Potawatomi Nation) hosts the Emmy-award-winning PBS cooking, travel and Native American culture, five-part series. 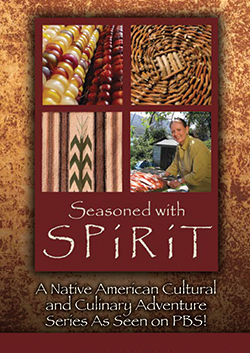 Seasoned with Spirit is a 5-part series that offers viewers a culinary celebration of America's bounty combining Native American history and culture with delicious, healthy recipes inspired by indigenous foods. Much more than simply a cooking series, each 30-minute episode of Seasoned with Spirit is a visually stunning, cultural adventure across the American landscape where viewers meet Native American peoples, see their breathtaking environs, learn their history and traditions, and, best of all, taste their cuisine.